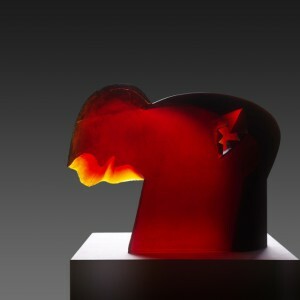 In the joint work of the glass artists Stanislav Libenský and Jaroslava Brychtová, the head as a theme was a common thread throughout their careers. From the initial Head-bowl (1956) to Head T (1997) there were over thirty works on a similar theme. This work arose from the joint endeavours of the painter Libenský and the sculptor Brychtová and besides demonstrating the unexpected possibilities of the technique of fused glass it also became a sort of manifesto of an entirely exceptional glass aesthetics in the work of both artists. Circle Head (later renamed to Gray Composition) from 1965 marked a departure from the original intimate conception of their sculptures and opened up the possibility for more monumental works. Afterwards several geometrically stylized works and a number of sculptures reflecting the gloomy atmosphere of the totalitarian regime in socialist Czechoslovakia of the time were created. In addition to works from the cycle Silhouettes of the Town, these mainly include sculptures from 1988 entitled Mankurt, Exclamation and Red Head. In the late 1980s Stanislav Libenský and Jaroslava Brychtová were guest teachers at the Pilchuck Glass School in the United States and within the art education programme they created the sculptures Head ´89 and Head with Hair. In terms of where they were created, these “American” sculptures lack some of the expressive charge of their previous work. Under the influence of their new experience and upon their return Stanislav Libenský and Jaroslava Brychtová made a second variant of the sculpture Red Head. While using the same stylization the new sculpture was changed in morphology, the expressive detail is slightly blunt in the contours and is balanced by a lyrical element. Due to this transformation Read Head II became such a primary work for the artists that they decided to include it among their archival works. To avoid any accidental damage when moved around needlessly, it has been permanently deposited in the family depository. For this reason Read Head II has never been presented to the public and therefore it is being premiered at this year’s presentation of the Stanislav Libenský Award 2014.